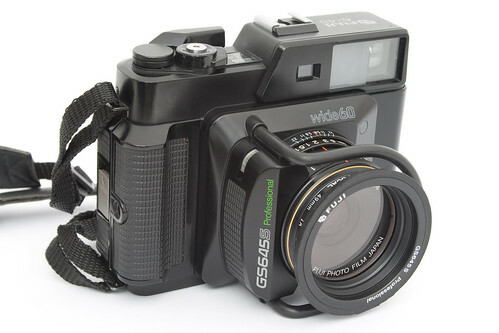 The Fuji GS645 series of compact rangefinders was available with fixed lenses of various focal lengths. They took 120 and 220 film and were known for very sharp lenses which, in the case of the S and W versions, were protected by a circular "cow bar". Lewis, Gordon, ed. The History of the Japanese Camera. Rochester, N.Y.: George Eastman House, International Museum of Photography & Film, 1991. ISBN 0-935398-17-1 (paper), ISBN 0-935398-16-3 (hard). P. 173. Omoide no supuringu-kamera-ten (思い出のスプリングカメラ展, Exhibition of beloved self-erecting cameras). Tokyo: JCII Camera Museum, 1992. (Exhibition catalogue, no ISBN number.) P. 8. Sugiyama, Kōichi (杉山浩一); Naoi, Hiroaki (直井浩明); Bullock, John R. The Collector's Guide to Japanese Cameras. 国産カメラ図鑑 (Kokusan kamera zukan). Tokyo: Asahi Sonorama, 1985. ISBN 4-257-03187-5. Items 1312–3.